Summer’s opening weekend calls for an extra-sunny toast, don’t you think? A cocktail that thinks outside the glass, if you will. 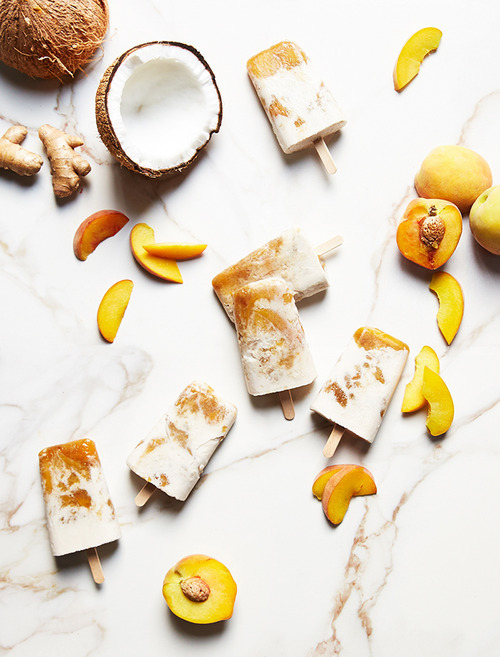 In the name of sea-scented breezes and palm-filtered rays, of morning glories and evening fireflies, join us in welcoming the fairest of weather with these bourbon-spiked, peachy-keen pops. In a saucepan, combine 2 cups bourbon, 2 tbsp. maple syrup, water, sugar and cinnamon. Bring to a boil, then reduce heat and allow mixture to simmer about 30 minutes; add ginger and simmer 10 more minutes. Remove from heat and let cool; remove ginger. In a baking dish, arrange peaches in a single layer and pour the reduction over them. Bake for 40 minutes, turning peaches occasionally. Remove and let cool completely. In a mixing bowl, whisk together coconut milk, vanilla and remaining bourbon and maple syrup. In alternating layers, pour each mixture into ice pop molds and secure sticks. Freeze several hours (or overnight) and serve with a generous helping of fun-in-the-sun.